Photos from today’s flight have been posted on the Boeing Flickr page. 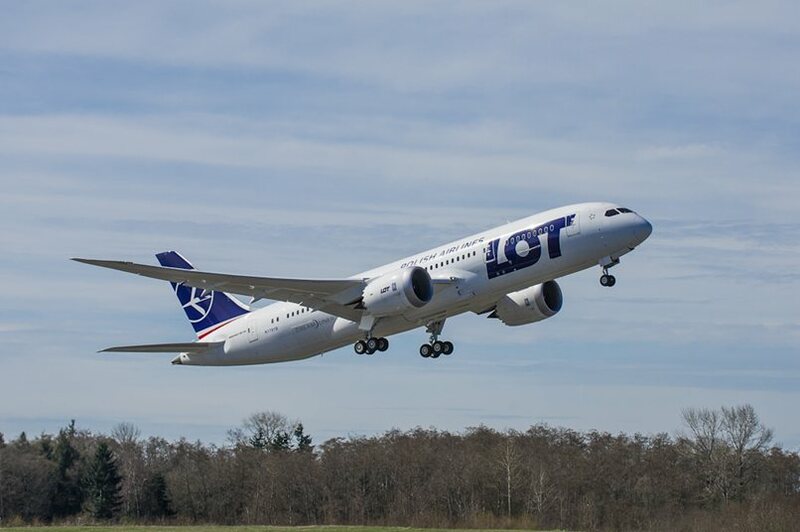 Boeing completed a 787 functional check flight today on Line number 86, a Boeing-owned production airplane built for LOT Polish Airlines. The airplane departed from Paine Field in Everett, Washington state at 12:11 p.m. PDT with a crew of six onboard – two Boeing pilots, two instrumentation engineers, one systems operator and one flight analyst. The airplane flew for 2 hours and 9 minutes, landing back at Paine Field at 2:20 p.m. PDT. The crew reports that the flight went according to plan. Today’s flight was a normal Boeing production check flight intended to validate that all systems function as designed. During the functional check flight, crews cycled the landing gear and operated all the backup systems, in addition to performing electrical system checks from the flight profile. More than 600 of these functional check flights were completed in 2012 across Boeing commercial airplane programs. With the completion of today’s functional check flight, we will analyze the data from the flight and begin preparations for certification ground and flight demonstration in the coming days. The plan is to conduct one certification demonstration flight. That flight, which will also take place on Line 86, will demonstrate that the new battery system performs as intended during flight conditions. As a matter of long-standing practice, we do not provide flight or specific test schedules in advance of flight plans being filed. Photos from today’s flight have been posted on the Boeing Flickr. ZA005, Boeing's fifth 787 flight test airplane, departed from Boeing Field at 12:32 p.m. Pacific time on Saturday, Feb. 9, with a crew of 13 onboard (Boeing pilots and flight test personnel). The flight lasted 2 hours and 19 minutes, landing back at Boeing Field at 2:51 p.m. Pacific time. The crew reports that the flight was uneventful. During the flight, the crew monitored the performance of the main and APU batteries. Special equipment onboard ZA005, which is currently the only member of the Boeing 787 flight test fleet in service, allowed the crew to observe and record detailed battery performance in normal flight conditions. Data gathered during the flight is considered part of the investigations into the 787 battery events that occurred in January. For that reason, we cannot share any additional details. We have no flights planned for ZA005 Sunday, but plan to resume flights early this coming week. As a matter of long-standing practice, we do not provide flight schedules in advance of flight plans being filed. Takeoff photos from today's flight have been posted here: http://www.flickr.com/photos/theboeingcompany/sets/72157632730482850/. Boeing will soon resume limited 787 flight test activities with a flight of ZA005, the fifth flight test airplane. This activity has been approved by the U.S. Federal Aviation Administration. This flight test activity will allow Boeing to conduct testing of the in-flight performance of the airplane's batteries, which will provide data to support the continuing investigations into the cause of the recent 787 battery incidents. Flight test activities are different from commercial flight operations and, because of the test environment, special considerations are always in place when the FAA permits such operations. With that said, while our work to determine the cause of the recent battery incidents continues in coordination with appropriate regulatory authorities and investigation agencies, we are confident that the 787 is safe to operate for this flight test activity. To provide additional precautions, we have implemented additional operating practices for test flights, including a one-time pre-flight inspection of the batteries, monitoring of specific battery-related status messages, and a recurring battery inspection. The company has an extensive team of hundreds of experts working around the clock, focused on resolving the 787 battery issue and returning the 787 fleet to full flight status. We are working this issue tirelessly in cooperation with our customers and the appropriate regulatory and investigative authorities. At the same time, a dedicated team of professionals is continuing to produce 787s and prepare them for delivery. As we have said before, the entire Boeing team deeply regrets the impact that recent events have had on our customers and their passengers. We are doing all we can to reach a resolution and begin again to meet their expectations. March 25, 2013 -- Line number 86, a Boeing-owned 787 airplane built for LOT Polish Airlines, departs Paine Field in Everett, Wash. for a functional check flight.